On the occasion of Navy Day, Flag Officer Commanding-in-Chief Western Naval Command, Vice Admiral Girish Luthra, emphasised that the navy is playing a crucial role in promoting the security and national interest in the maritime domain of the country. Addressing the journalists at the annual press conference of Navy Week 2018, on-board the Western Fleet’s stealth destroyer INS Kochi, at Mumbai on 3 December 2018, Luthra said the economic highways that pass through the Indian Ocean Region are constantly under the navy’s surveillance and it has focused on technical upgrades over the past years. He said the Indian Navy was involved in the development and promotion of innovation and technology to improve the coastal security network, and many such projects will be fully implemented in the near future, such as the fully functional National Command Control, Communication, and Intelligence (NC3I), Common Operational Picture (COP) in the maritime domain. 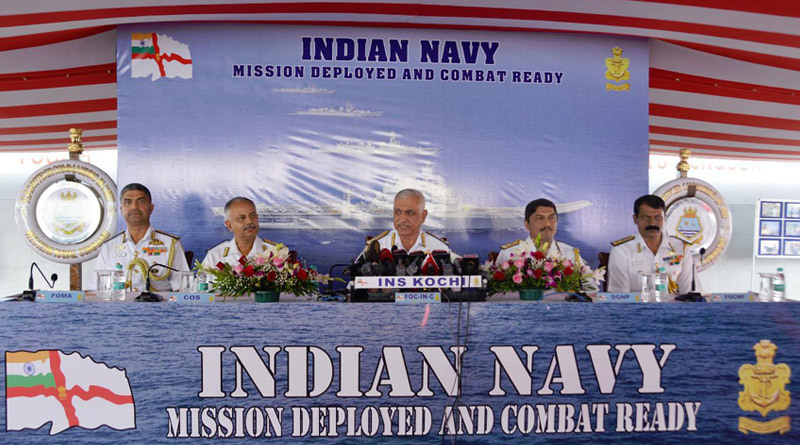 The Commander-in-Chief, in his opening address, apprised the media about the initiatives and milestones achieved by the Western Naval Command over the past year, including mission-based deployments, exercises with foreign navies, security, safety, humanitarian aid and disaster relief, environmental consciousness and activities connected with the Golden Jubilee of the Western Naval Command. The Indian Navy celebrates Navy Day on 4 December every year, the date on which during the 1971 Indo-Pak conflict, naval ships, armed to the teeth, stealthily manoeuvred off Karachi, and unleashed a lethal missile attack that left the port ablaze and destroyed several enemy warships.